Villa Araliya is a colonial-inspired 5-bedroom vacation home, located just 200 meters from Beruwala Beach in Bentota. Featuring a massive private tropical garden, this villa is perfect for families with active kids wanting to play outdoors, run around on the lawn and go for a swim in the sea. Villa Araliya is a very comfortable and affordable option for those who want to stay somewhere peaceful and close to the beach. The villa has got antique furnishings and the overall feel is homey yet sophisticated, exuding old-age charm. In total, Villa Araliya houses 5 bedrooms. 3 of them are tucked in the main house and the other 2 are found in a separate garden bungalow, offering extra privacy for those who can appreciate this. All 5 bedrooms are equipped with AC and ceiling fans to suit everyone’s needs in Sri Lanka’s tropical climate. The rooms in the main house are furnished with four-poster queen-size beds and the bungalow bedrooms are fitted with double beds. All 5 bedrooms are perfectly comfortable for a good night sleep and waking up to the garden views and the fresh ocean breeze is just wonderful every day again! The garden of Villa Araliya is massively big and utterly tropical, planted with palms, frangipani trees and flowering plants, like a little slice of private paradise just 200 meters from the beach. 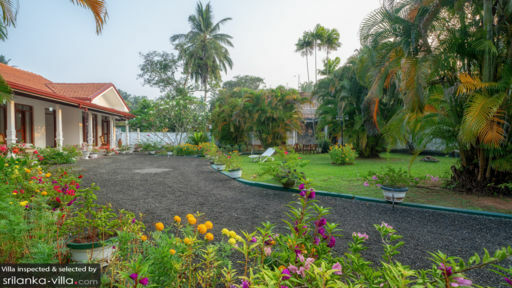 The garden is landscaped beautifully with pathways in between the manicured green grass lawn, potted plants along the garden lanes and cosy little sitting spots on the grass and on the veranda to sit and enjoy the tropical surroundings. The combined living and dining room features a minimalistic interior design, furnished with Dutch Colonial furniture and decorated with framed Sri Lankan artwork mounted to the walls. The sitting area features an intricately-carved teak wood sofa as well as a modern soft cushioned sofa to curl up with a book. The dining area features a large teak wooden oval dining table, big enough to accommodate all 10 guests staying at the villa. The kitchen is very spacious, designed with lots of wooden cabinets and drawers stocked with kitchen utensils. There is a round breakfast table there, too - the perfect spot to sit and have coffee in the morning, reading the news and getting ready for another lovely day in Sri Lanka. A business table also available if the guests wish to work or use their computer. Villa Araliya comes with friendly staff to take care of the household and prepare breakfast (additional charge) for all the guests in the morning. Lunch and dinner are also available at additional charge. The staff can also help to arrange excursions and more upon request. Don’t hesitate to ask! 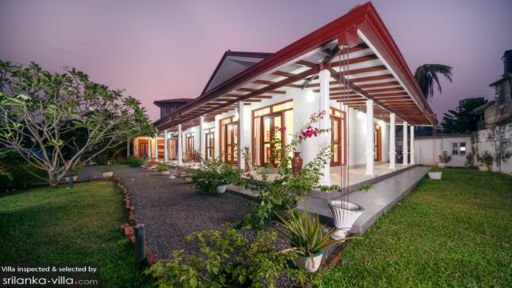 Villa Araliya is located in a little village near Bentota on the southwest coast of Sri Lanka. The nearest beach is Beruwala Beach and it is just 200 meters away from the villa without having to cross any big roads, perfect for families with kids! The golden sands at the beach and the clear blue sea are utmost inviting and the water is perfectly safe for swimming. Feel like swimming in a pool? You are in luck, the 5-stars Cinnamon Hotel is just 150 meters away. At Approximately USD 20, you can enjoy lunch by the poolside and plunge in afterwards. Awesome! 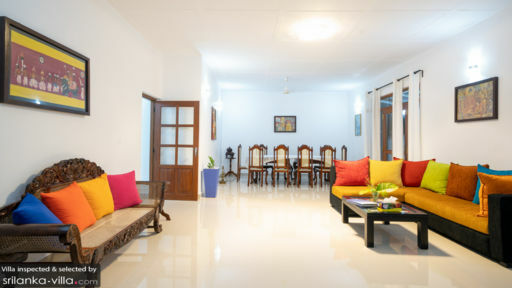 The location of Villa Araliya is also perfect to go on daytrips to see beloved beach towns such as Hikkaduwa and Unawatuna and to go see the historical city of Galle. The international airport of Sri Lanka is 122 km away from the villa.